REGISTRATION FEE SCHEDULE All figures are in US dollars ($). †The Guest Fee is not for use by co-workers. Fee payments must accompany all registrations by the deadline to qualify for the applicable discount. GRC members receive $25 off the Ranavirus Attendee fee. (Not available for Student Attendees or Attendees of both conferences, whose fees already reflect significant discounts.) Please contact Jesse Brunner (jesse.brunner@wsu.edu) for information on how to receive the GRC discount. The Ranavirus attendee fee provides full participation in the Ranavirus symposium (May 30-June 1), conference materials, an eco‐friendly tote, along with all functions indicated on the conference agenda. This includes morning, mid‐day and afternoon networking breaks, lunch provided by the Hilton, a Poster Session Reception on Saturday, May 30th, and a Networking Reception at the Florida Museum of Natural History on Sunday, May 31st.On June 1st, an optional field trip or workshop is available for an additional fee (see above). 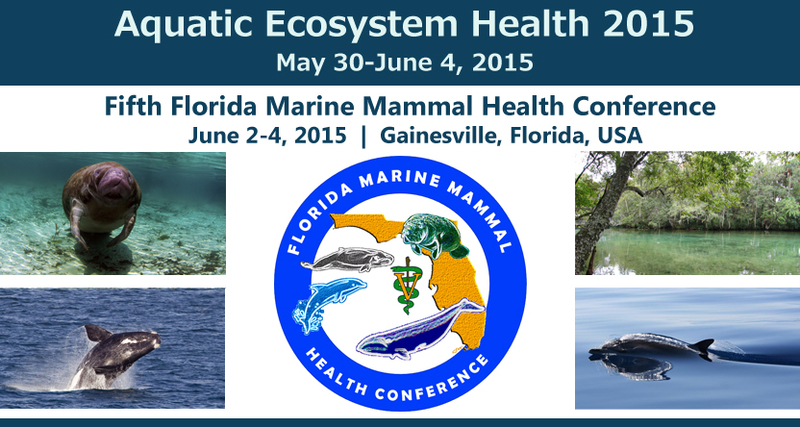 The Florida Marine Mammal Health attendee fee provides full participation in the Marine Mammal Conference (June 2-4), conference materials, an eco‐friendly tote, along with all functions indicated on the conference agenda. This includes morning, mid‐day and afternoon networking breaks, lunch provided by the Hilton, a Poster Session Reception on Tuesday, June 2nd, and a Networking Reception at the Florida Museum of Natural History on Wednesday, June 3rd. Aquatic Ecosystem Health Attendees (both conferences): The Aquatic Ecosystem Health 2015 Attendee fee allows participants at the Florida Marine Mammal Health Conference to attend the Ranavirus symposium at a reduced rate. Aquatic Ecosystem Health 2015 brings together the Third International Symposium on Ranaviruses (May 30-June 1) and the Fifth Florida Marine Mammal Health Conference (June 2-4). The joint rate includes full participation in both conferences (see above). Guest Fee: The guest fee allows guests 12 years of age and older to attend the evening social at the Florida Natural History Museum. Refund Policy: All refund requests must be received in writing by April 20, 2015. A processing fee of $175.00 will be charged for all meeting participant refunds, $25.00 for all guest and student refunds, and $10.00 for all field trip and workshop refunds. Special Needs: Participants with special needs can be reasonably accommodated by contacting the Conference Organizers at least 20 working days prior to the conference. For information or to request accommodations, please contact Patrick Thompson (thompsonp@ufl.edu) or Thomas Waltzek (tbwaltzek@ufl.edu). Please Note: There will be no ONE DAY registrations. We are pleased you wish to register for this event. we will be happy to register you on-site.